The ISCA Board welcomes all practicing and retired school counselors to join the board or one of the committees. Learn about joining the ISCA board from current board members in this panel discussion recording. Individuals can indicate interest for an ISCA Committee on the ISCA membership form, conference registration form, or as part of the annual conference feedback. You can also email the Board Chair for the committee that suits your interest. Learn more about ISCA Committees. 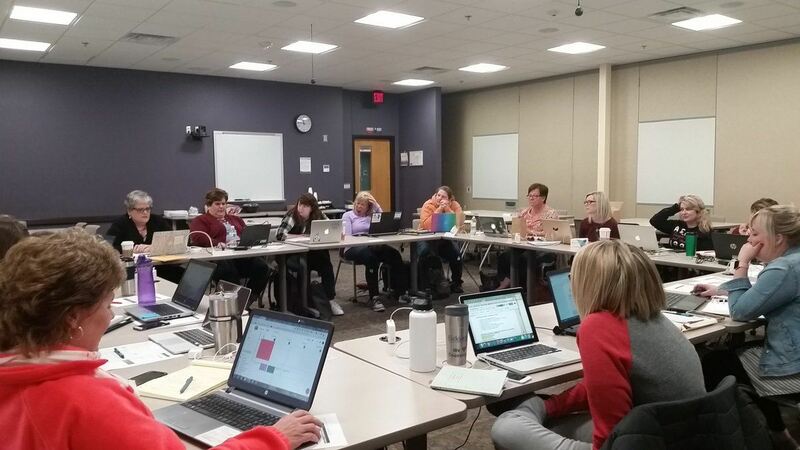 ISCA board members hold one of our annual meetings at the Heartland AEA in Des Moines. Consider School Counselor involvement at the state level. It is a wonderful opportunity for networking, honing your skills, and contributing to the school counseling profession in the state of Iowa. ISCA elections are held in January each year and winners are announced during National School Counseling Week. Open elected positions are announced at the annual conference each year. Open appointed positions are announced in March of each year. To view the full election calendar, click here. When positions are open (elected or appointed), ISCA members are invited to apply via email, as well as through social media. Individuals can also indicate interest on the ISCA membership form, conference registration form, or as part of the annual conference feedback. Or email the current President for more information about an open elected position. Learn more about the Election process and timeline. a. Elected officers are the: President, President-Elect, President Elect-Elect, Immediate Past-President, Elementary VP, Middle School/Junior High VP, Secondary VP, K-12 VP, and Counselor Educator VP. b. Elected officers must be employed as a counselor in, or retired from, the work setting being represented. c. Vice-Presidents are elected for a three year term. d. Elected officers are nominated and voted upon by the ISCA membership in January. a. The Secretary and Treasurer are appointed by the Executive Committee and serve for a three (3) year term. a. The Board Chair positions are appointed by the Executive Committee and represent their committees on the Board. b. The Board Chair positions are: Awards and Recognitions, Government Relations, Membership, Newsletter, and School Counseling Student. a. Ad Hoc Board members represent the DOE, AEA’s, ISEA, and ICAN and are appointed by the Executive Committee. While there are some meetings and responsibilities, many of the duties of board members are accomplished via telephone, e-mail, and webinars. All Governing Board members are expected to participate in three ISCA Board meetings held on Saturdays usually in January, April, and September, the annual conference in November in Des Moines, and the Summer Leadership Development Institute (LDI) and July board meeting usually held for two days in July (location to be determined). In the different president roles, representation of ISCA at the national ASCA conference, Delegate Assembly, and LDI held in the summer and financially supported by the ISCA Board is expected. Board members may also be asked to represent ISCA at state or regional meetings, professional development, and other professional activities. Members of the Governing Board do not receive any financial compensation for their service. However they are reimbursed for travel expenses and other costs. All Governing Board members are expected to pay for their ISCA conference registration, travel, and hotel. Those who have been Board members have recognized the additional benefits of this leadership experience that include networking, learning about school counseling issues and strategies to advocate for the profession and for school counseling issues, collegiality, and professional and personal development.